I’ve been reading Dr. Mariottini’s blog for a few years now and have learned a great deal from doing so. His review of the movie “Noah” contains a number of “spoilers” but is a good guide, I think< for a Christian to decide whether or not they will go see the movie. It's up to you. I now feel I can go and enjoy it because knowing what to expect it will not be a surprising disappointment. 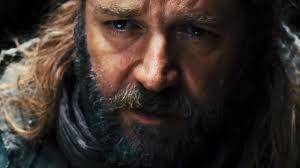 This post is a review of the movie “Noah.” If you have not seen the movie but are planning to see it in the near future, I recommend that you do not read this review. Read it after you have seen the movie. Below I will mention what I liked about the movie and the reason this movie is not a retelling of the biblical story. Last weekend my wife and I went to see “Noah” the movie. I liked the movie, but my wife did not. As a movie, Noah was a good movie, but as a biblical story, it does not come even close to what the book of Genesis says about Noah and the flood. There are several issues in this movie that do not reflect the biblical narrative.